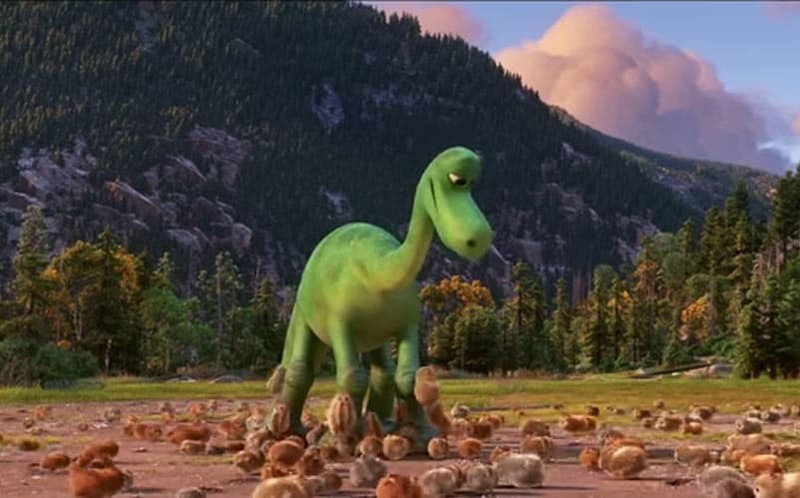 New Good Dinosaur Trailer Gets Us Right in the Feels | Nerd Much? One of our most anticipated animated movies of 2015 is Disney Pixar’s The Good Dinosaur, and today, the studio released a brand new trailer for the movie that, for lack of better phrasing, gets us right in the feels. The new trailer focuses on how Arlo was taken away from his family, and how he first meets up with his new human friend (which the trailer oddly depicts as Arlo’s pet, but that’s a discussion for another day). The Good Dinosaur cast will include Anna Paquin, Steven Zahn, Raymond Ochoa and more. Of course, the original cast included John Lithgow, Bill Hader, Neil Patrick Harris and Judy Greer, and then they were all inexplicably replaced. While we would have preferred to see the latter cast in the film, Paquin, Zahn and Ochoa are still welcomed replacements. The Good Dinosaur will be Pixar‘s 16th animated feature film, with their 15th movie, Inside Out, releasing to critical acclaim earlier this year. The studio also has Finding Dory, Toy Story 4, Coco, The Incredibles 2, and Cars 3 in development. You can see all of the upcoming animated movies here. The Good Dinosaur‘s release date has been set for November 25, 2015, but there are plenty of other animated movies on the way this year.